Or la consommation de bière, initialement limitée au Nord et à l’Est de la France, s’est « nationalisée » au XIXe siècle, permettant l’augmentation de la production de 2,8 millions d’hectolitres en 1815 à 7,4 millions en 1879, malgré la perte de l’Alsace-Lorraine, et à 15 millions en 191312. Les brasseurs alsaciens ont largement participé à cette expansion par leur dispersion sur le territoire français, acquise aux deux tiers avant même 1870. On les signale à Bordeaux et à Pau en 1806, à Nérac en 1808, à Beaune en 1812, à Carcassonne en 1815, à Melun en 1816 et dans beaucoup d’autres villes. A Lyon, par exemple, la fameuse brasserie Georges avec sa salle de plus de 700 m2 fut construite par Georges Hoffherr en 1836 et exploitée au cours des temps par les familles alliées Umdenstock et Rinck ; à Chamalières, la brasserie Kuhn accueillit en 1871 Pasteur qui y mit au point la méthode de la pasteurisation consignée dans les Essais sur la bière publiés en 1876 ; à Rennes, la famille Graff exploita la brasserie de la ville pendant plusieurs générations. The above quotation is from: Nicolas Stoskopf. Quitter l’Alsace pour faire fortune : le cas des entrepreneurs du XIXe siècle. Diasporas Histoire et sociétés, 2006, pp. 43-55. The paper studies the dispersion into France in the 19th century of entrepreneurs from Alsace including brewers. Stoskopf makes the interesting point (among many) that 2/3rds of these emigrant brewers left their home province before 1870. Thus, (me talking here) the lore that the Prussian victory of 1870 cause a mass exodus of Alsatian brewers to the rest of France and beyond is only partly true, and really only minimally so for France itself. The perception may have arisen since, by 1870, brewing had industrialized itself in the east, to a much greater degree than in the north at that time. So that, post-1870 emigrant brewers brought a greater degree of technical skill, notably in the emerging, refrigerated bottom-fermentation (lager) field, than the first wave. The scale of production associated with that may have led observers to accord greater importance to post-Franco-Prussian War emigration than, viewing the picture as a whole, is warranted. Indeed Stoskopf notes that most of the early emigrants – to place like Bordeaux, Lyon, Nérac (in the southwest, part of Lot-et-Garonne) founded artisan businesses that did not make the transition to the new industrial brewing era. Yet, he notes that some did, including Georges in Lyon or Graff in Rennes. Other names familiar to brewing historians are mentioned, the Veltins family in particular. While he mentions implantation to Nérac, he does not mention the main brewery. It was Laubenheimer; the founder of that name came from Alsace. The dates of arrival vary, 1828 is stated in a number of sources as well, see e.g. here. Still, he was an early arrival, who with his diaspora helped spread brewing through regions where it was unknown, or only minimally represented, in the 1700s. Laubenheimer and heirs were thus of those able to negotiate the technological changes into the late 19th century and after. 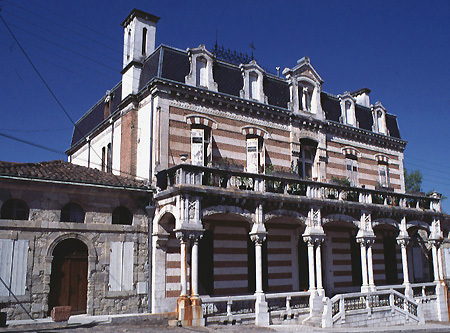 They built a large plant in Nérac that endured until 1940 or 1957 (accounts vary). Therefore, what probably originated as primitive top-fermentation brewing became a sophisticated European lager plant. The devastation of WW I in the north and east did not visit remote areas like the southwest. This may have given Laubenheimer’s a boost when competing in the inter-war era. Still, why would Fraunces, a pre-revolutionary, Anglo-American tavern that operates to this day, carry such a beer? At an obviously high price, too. There were many renowned choices to select, from Germany, the Czech lands, from Alsace if need be: why look to a small town in the old Gascon country, not ever famed for brewing although Laubeheimer’s beer was no doubt quite sound by then? It’s hard to know. Maybe the sommelier at Fraunces was from Lot-et-Garonne, or … there must have been a connection of some kind that explained it. Maybe it’s as simple as, with nothing coming in from Nazi Germany and Czechoslovakia, from 1938 American importers looked to France for supply. Still, there were many names better known than Laubenheimer in that year, and the war hadn’t started yet. And why the prefix “1938”? Beers weren’t typically vintage-dated then. In April 1940, Europe had been at war for half a year. America had not yet joined. Imports were being shut down, but Fraunces may have had older stocks in the cellar. The Heineken mentioned was probably from the Dutch East Indies (Heineken had a business there), even though the Nazis took until May that year to overrun Holland. All this resulted from various blockades, especially Britain’s, and domestic war measures. One way or another, wartime or eve-of-war conditions probably explained the choice of a regional French beer like this. Anyway, from a New York standpoint, to offer a prewar import was probably a coup, albeit with price to match. By this period, Laubenheimer was known for its blonde and brown lagers, but were they good after a couple of years in the bottle? Perhaps, those were the days of reasonably high hopping and probably all-malt. Who knows what would have happened had WW II never occurred. Laubenheimer might have grown its U.S. franchise. “Lauby’s” might be as ubiquitous today as Heineken, or even have replaced it. I can taste Heineken anytime, it is available across the counter at virtually every bar in Toronto. I can’t taste Laubenheimer. Or, maybe I can, via the lens of history and mellow reflection. Maybe you can, too. 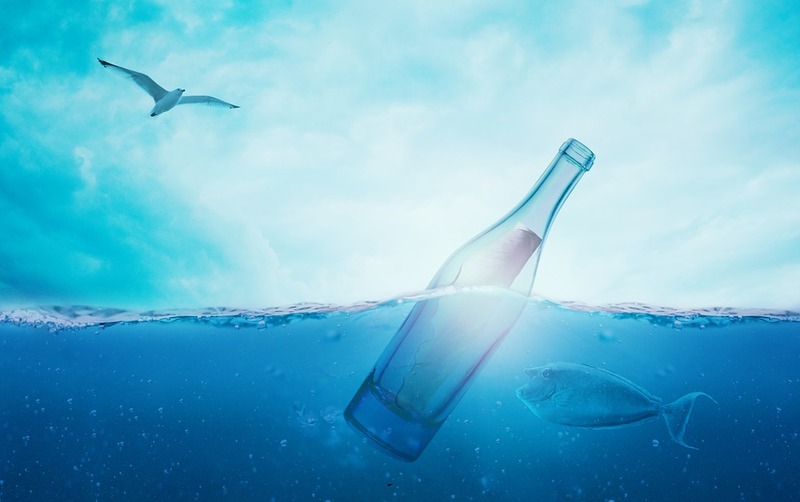 Note re images: The first image was sourced from a French bottle cap collection site, here. The menu extract is from the digital archives of the superb menu collection of Johnson and Wales University, here. The third image was sourced from Ebay France, here. The last was sourced from this French historical site, here. All intellectual property in the images belongs solely to their lawful owner, as applicable. Used for educational and historical purposes. All feedback welcomed. The endlessly fascinating question of chop suey’s origin was explored by me, here, last year. I was taken by a 1902 story in California’s Amador Ledger that suggested U.S. Consul (William E. S.) Fales in Xiamen, formerly Amoy, China introduced the dish to America. However, further digging suggests that while the consul did clearly like the dish and praised it in print on November 3, 1901 in the New York Times, see here (“How to Make Chop Suey”), he probably did not introduce it to America given there are at least two citations in 1880s journalism that mention the dish, authored by a Chinese-American journalist. See the comment to my earlier post, by Tim Shook, which mentions these earlier articles. In this interesting historical blog about one year ago, Through the Hourglass, whose author I cannot determine, Fales’s China career is recounted: it appears to have been from 1890-1894. He must have hailed from NYC, as friends there gave him a “welcome home” dinner in 1894. The menu is preserved at the NYPL archives and is referenced in the blog post. The menu is conventional Anglo-French-American fare, except it does contain a “China punch”. However that was put together and while an evident nod to Fales’s days on the China station*, it does not refer to a food. Even if chop suey had been included, it cannot predate the earlier citations mentioned. Did Fales play a role in enlarging the footprint of a foreign dish that otherwise might have remained of little significance? Possibly, but clearly the dish was known in America, e.g. Wichita, before Faley boarded ship for China. Still, the recent historical work adverted to in my earlier post, together with apparent notoriety of the dish in the part of China where Fales served, does suggest, or to me, that chop suey is not a faux-Chinese dish, partly American as was long assumed. It appears to be genuinely Chinese albeit from a remote, coastal region and was not therefore part of the culinary repertoire belonging to the whole country. Note that the Wikipedia article references Guandong province as the place chop suey originated, whereas Amoy is in Fujian province, which is just to the north. However, a look at the map suggests, at least to me, that a dish known in Guandong probably had currency in adjoining Fujian. Both are on or near the sea and it is understandable that seamen departing this general region brought this old dish with them. Perhaps – see again Wikipedia – the dish was national at one time in China, although we incline to a regional origin at least when the bulk of Chinese seafarers left for distant ports. True, Taishan in Guandong, said to be the true centre of the chop suey dish, is about 500 miles from Amoy/Xiamen, but a glance at the map will show this is not a huge distance in a country the size of China. This is especially so as both are coastal centres that would have easily communicated by sea. It is thus understandable in our view that Faley indeed did encounter the dish when on assignment in Amoy. See map details, here. *Perhaps a pun on the porcelain container, or simply a reference to the latter. “China punch bowl” was a 19th century expression, similar say to Lalique crystal of today. 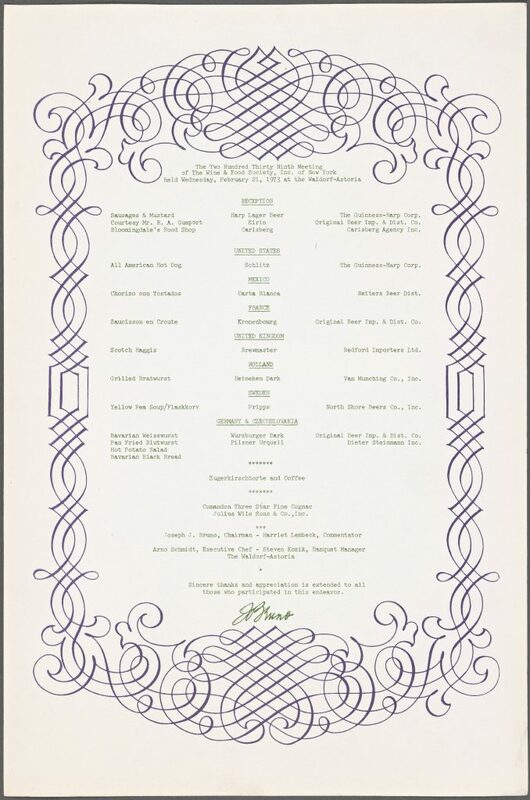 On February 21,1973 the New York International Wine and Food Society (IWFS) held an event at one of its favoured haunts, the Waldorf Astoria hotel. Last Wednesday, at the Maple Leaf Tavern on Gerrard Street in Toronto, we recreated that dinner and beverage service – 45 years later to the day. While a sommelier was present (as a guest) and the restaurant has an excellent wine list, no wine was served. Beer was served, because the Wine and Food Society held a beer event on that occasion, as it had done periodically in its history. Above, you see the recreated menu, which followed the original one closely. For the beers we used a couple that were on the original list, French Kronenbourg and American Schlitz, and selected others similar in character to the (mostly) imported beers on the original list. The event was a great success, each course was nigh perfect and the beers matched the sausage-centric night to a “t”. While the beers were mostly the international blonde lager type, we did also have a dark wheat beer – it substituted for a couple of dark lagers on the original list; a fine craft lager from Ottawa, Vim and Vigour; and an English pale ale. Given the rich flavours of the food I am not sure the highly-flavoured beers characteristic of the modern beer renaissance would have matched better, although it would be interesting to try! Greg Clow of Canadian Beers News co-hosted the night with me. The guests were most impressed with the skills of Jesse Vallins, who is not only an experienced professional chef but a specialist in the sausage art. All his productions were made in-house and plated in inviting and attractive fashion. The centrepiece course was a pairing of two sausages, German Bratwurst and Weisswurst, served with a tangy, appley sauerkraut and rich chunky potato salad. The famed German white sausage part of the duo is (or was) a morning specialty in Germany. We served it at night, following the original menu, with creamy Erdinger Dunkel, a dark wheat ale, and the zesty, malty Vim and Vigour lager, alongside. The last course, Swiss cherry layer cake served with a small Cognac alongside, added a final touch of Waldorf elegance. It always surprises me that historic menus aren’t created more often. It offers a window on the past, and can show that past generations enjoyed a high standard of culinary excellence. The modern culinary scene is one of great diversity and constant creativity. Enviable it is to be sure, but its approach is not really new. In the past, small, often elite groups enjoyed similar or parallel experiences. Today, the same idea is available to many more due to an expanded standard of living and the information revolution. if you want to find a recipe for, say, Chorizo con Tostada you can find numerous ones online. Still, I doubt most home chefs could make it with the skill Jesse Vallins did. And the same applies for the rest of the menu. Sausage in particular can be difficult to execute at home. I brought out these points in my presentation at the dinner, and also that this kind of event has a significant cultural and intellectual resonance. Food and drink are not just about sustenance, conviviality, or even a family’s or particular ethnicity’s tradition: they can also be about discovering, learning, comparing. This is what “gastronomy” means, a term devised in the early 1800s by French food theorist Jean Anthelme Brillat-Savarin. In tune were two English food writers of the early 1800s whom I quoted at the event. ** Those writings commented how beer offered welcome variety at the dinner table. In a word, food, beer, and wine culture today may often be different, but is not usually better, than what came before. More than a certain income or social status today, what is needed to understand culinary traditions is primarily a good sense of curiosity and an online connection. At least, it’s a good start! 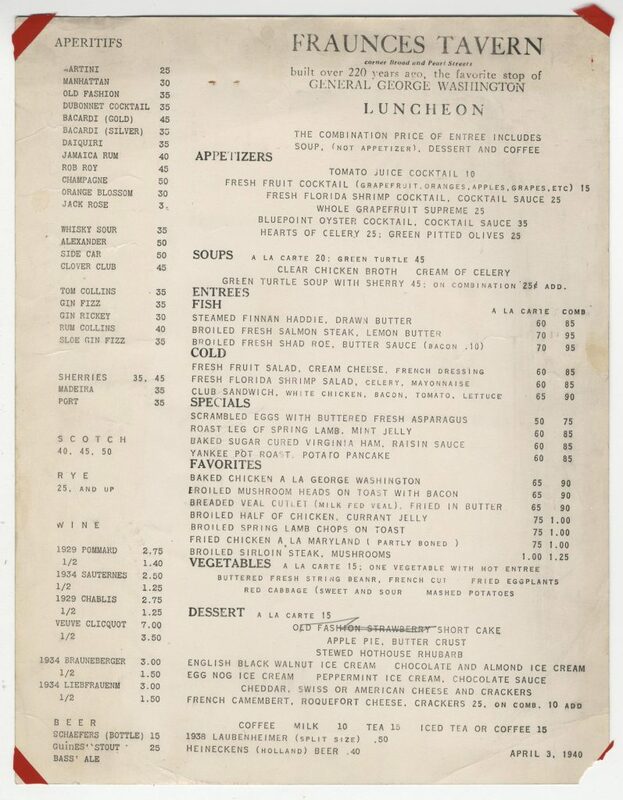 The original 1973 menu is below, sourced from the menu archive of New York Public Library (www.nypl.org). See here for the specific page. *As an example, see this earlier post on the history of the wine-and-cheese party. **For more details, see here. 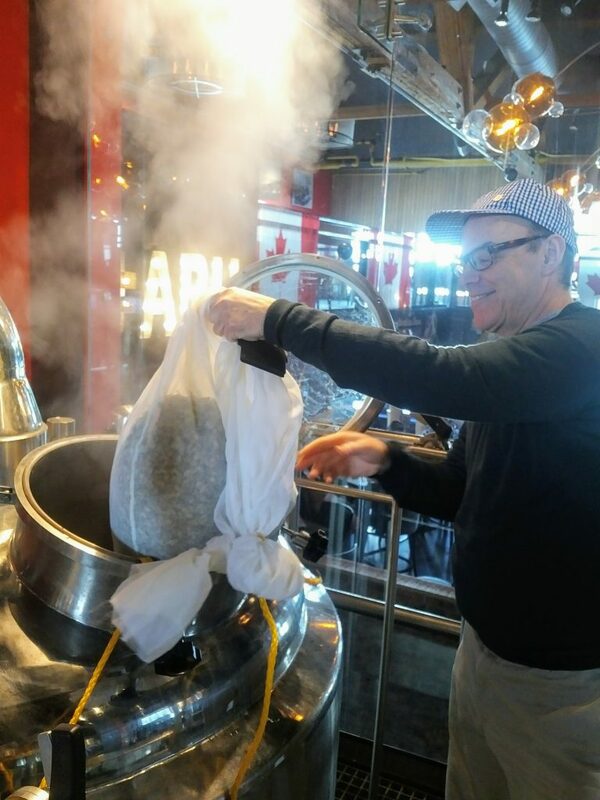 This is a follow-up to my post on brewing a collaboration AK with Amsterdam Brewing Co. in Toronto earlier this month. As the basis, we used the brewing directions of “Aroma”, a pseudonymous brewer – evidently he was a brewer – who answered a question in an 1870 issue of the periodical English Mechanic and World of Science. In an earlier post, I reproduced the account, see here, bottom-right corner. The related discussion may interest some as well. I found it a few years ago when searching for the answer to why “AK”, a member of the bitter beer family, bears that name. Indeed, Aroma offers his explanation, it means ale for keeping, or keeping ale evidently. This is the only evidence I am aware of that suggests what AK actually means. Aroma’s directions, which apply both to AK and higher-gravity IPA, were supplemented by recourse to numerous brewing texts, brewing journals, and encyclopedia discussions of the period. The sources covered part of the late-1800s, when the key elements to bitter beer were more or less constant, e.g. fairly heavy hopping, one (pale) malt only, starting/finishing gravities, typical methods to cleanse and clarify the beer, pitching and maximum fermentation temperature, storage temperature, storage time, timing of hops additions, etc. Of course even in a single source one might read different approaches. Aroma himself for example states that the boil could occur for one to two and a half hours. We used one hour. He stated a somewhat higher maximum range for fermentation temperature than we used, but other sources were in accordance with our maximum. It would have varied for some brewers at different times of year anyway. As in any brewing, a final choice was made that we felt represented reasonable parameters for this type of beer. The idea was to brew a beer that in its essentials would be recognizable to a person from the era, not least Aroma himself. We shall never know for sure of course, but I believe we got close. Back in the 1970s an early modern beer historian, Dr. John Harrison, had both the theoretical and practical interest. He served a London porter to an aged person who had worked in London before WW I. She was at the home of someone involved with the recreation. In 1976, Dr. Harrison made a black potion and offered it as “Guinness” to a lady who was 86 years old. “This isn’t “Guinness”, she scolded him. “This is London porter. I used to drink this when I was in service.” The sample had been based on a Whitbread London Porter from 1850. Soon, all such witnesses will be gone. Similarly, I am hoping my 1870 time trekker would state, “this isn’t your ‘IPA’ made with the new style American hops, this is our English AK” – even as he or she must remain imaginary, a conjuring. Thanks again to Amsterdam and Iain McOustra’s brewing team for their interest and commitment to this project. Beer (name is not finalized yet) should be ready in another three to four weeks. If you look at pg. 29 in this cocktail manual, The Reminder by Jake Didier, published c.1905 (no date shown) at pg. 29 a recipe for “beer sour” appears. This is very interesting, it is: add four dashes of lemon juice in a glass and fill with lager beer. A dash’s quantity will always be controversial, perhaps pedantically so. 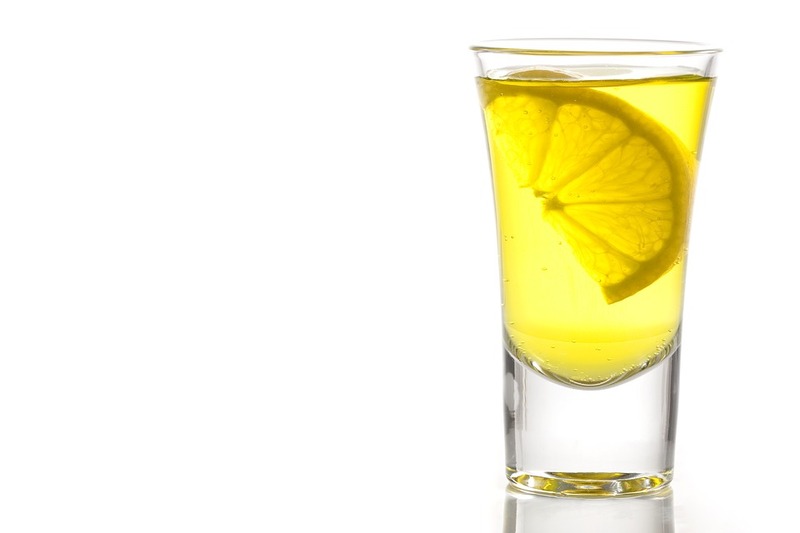 Take a lemon wedge, then do four, not over-energetic squeezes in a glass, you’ve got it. Pour in your lager. Given the whole history of 19th century bottom-fermentation and of improving brewing technology to banish acidity, why introduce it in beer? I think the reason was, as lager replaced the often-tart ale, some people missed the tang of slightly-off ale. So, put lemon juice in good beer. A similar trick was used earlier in Britain to make very new ale taste old, Seville orange, sulphuric acid, or something similar was added. Didier’s book ran to a 5th edition, the one I linked is I believe the first and rather crudely printed and bound. The last edition I read, 1917’s, omits the “beer sour”. Yet today sours are a successful category of craft brewing. Many people like the tart taste, and it has come back in this form. Belgian lambic and other sourish ales inspired the trend here. Albeit the taste had just barely survived in Belgium itself. The lemon wedge with some wheat beer is a stand-by of course, although I think there it is not to balance a sweetness, but more to complement the wheaty taste. Pre-Prohibition lager was quite malty, as I have documented earlier, and remained so in post-Repeal brewing until World War II. Some ale drinkers who couldn’t get ale easily probably figured out that lemon juice masked the sweetness and provided a tang they recalled in old ale, hence it becoming a bartender’s trick. I’m not sure the panaché/shandy idea is similar as those are very sweet drinks but the lemony connection may mean something. I don’t know about four dashes but acidity is a funny thing, you need a certain amount of it in any beer. I’ve added different acid agents and sometimes you wouldn’t know anything of the like was added, if you don’t add too much that is. Anyway, purpose-made sours: what’s old is new again. However, it is safe to say the sour taste was even then, and is certainly today, the preference of a decided minority, indeed a minority within a minority where craft beer is concerned. In some 40 pages, Virginia Elliott, a 20th century journalist and writer based in New York, delineates in some detail an approach to beer cuisine. It’s set out in the seemingly oddly-titled Quiet Drinking, although the date of publication, late 1933, suggests I think the reason: raucous drinking in well-insulated speakeasies, or perhaps in the memories of some who knew the pre-Prohibition saloon, was now of the past. Probably because legal beer was so new, Elliott does not explain the different styles or traditions. The most she gets into it is “light and dark”. Her palate advice is restricted to: buy a few brands. Taste successively, eating a bit of white bread between. Decide which you like, and it may end as a local brand and not the most expensive (good advice). Lay in a supply and forget hence about brands. It’s one way to go about it, and not necessarily the worst. The book really shines, first, in the area of beer-drinking accessories. The full range of paraphernalia is discussed including glasses, mugs, trays, picnic hampers, and cooling devices – she did not appreciate warm beer, which perhaps suggests the limits of her expertise, but still. She also spends time on draft service and how to do it properly, probably for a new generation of legal bar owners arising. Yet, it seems too people then regularly got in a quarter-keg for a party, and she insists on the right ways to handle such beer to avoid waste. She states baldly that draft is superior to bottled because not pasteurized. It’s something often stated in beer or brewing literature of the early 1900s and late-1800s, but not often heard today. In part this is because most craft beer is not pasteurized, but it’s a point always to be retained, as the process does exact, I think, some cost albeit it provides benefits in some scenarios. The food discussion in the beer chapter is where Virginia Elliott really takes flight. She describes a long list of hot dishes suitable for beer. Everything from kidneys to curry. Most dishes are from bourgeois cuisines, generally from northern Europe where beer is a tradition. 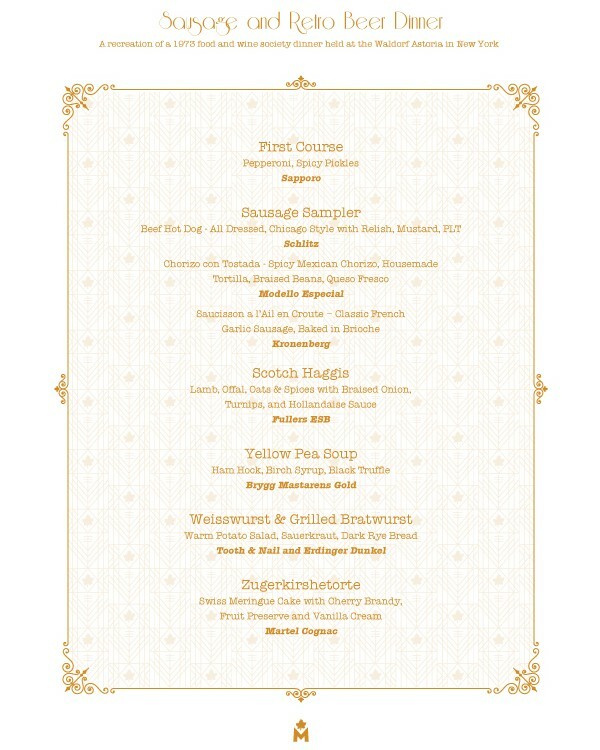 Welsh rabbit and variants feature, a host of different hot sandwiches, German-style frankfurters and knockwurst with kraut of course, smoked and picked fish, cheeses, cold Teutonic sausage plates (called “Dutch lunch” then), hams, and similar. The foods are described in good detail including, say, four different kinds of imported liverwurst. One German sausage containing donkey is mentioned without the usual verbal frisson – sign of the true gastronome. The 1940s beer tastings of the New York Wine and Food Society that I’ve referred to earlier featured selections from most of these categories except the supper dishes. One can see the influence Elliott’s book exercised. I can’t find much on her biographically. She died in 1977, was married, and in the 1920s had collaborated on another drinks book with Iowa-born author Phil Stong (not her husband), famous for writing State Fair. A strange feature of 1920s gastronomy in the U.S. is the considerable number of books issued on drinks and related advice. Even though it implied encouraging people to seek illegal alcohol, writing such guides was not unlawful as such. One book I saw even contained a recipe to brew beer at home. 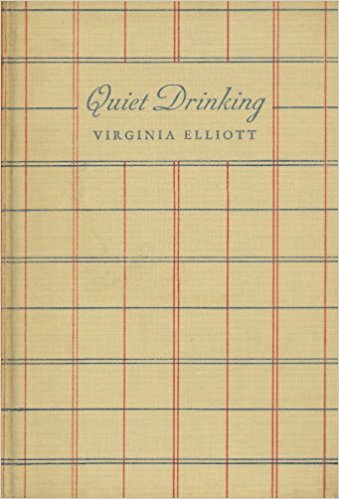 Although part of a larger book on wines and cocktails, Elliott’s book is a useful window on how food was viewed from a beer standpoint in the mid-1930s. There is much from pre-1920 that she continues, but her discussion is perhaps the most comprehensive I’ve seen in America to that date. There is no usage, except in Welsh rabbit, of beer in the supper recipes or theory advanced in that regard: otherwise conventional foods meant to accompany beer were the focus. No unusual combinations are suggested although she does encourage the reader to come up with his or her own ideas. Beer used in recipes in the way of wine, or as accompaniment to non-traditional dishes, was still decades away. Still, Elliott’s book is a part of the long pathway that led to today’s plethora and beer-and-food books. The peasant or dark breads belong with beer. Pumpernickel of course is a German favorite. If you like the very heavy kind any good German deli­catessen can furnish you with an imported one, done up in many layers of foil, which is thinly sliced, very soggy and quite delicious. The pumpernickel which is made by your local baker will not be as heavy nor have as decided a flavor, but is good. Jewish deli­catessens have one with a particularly nice twang. Imported Khommissbrot, the coarse, heavy bread eaten by the German soldiers, is good with cheese. It comes in pound packages, thinly sliced, and is only fifteen cents a pound. Malskorn* is the very heaviest of the pumpernickels. Black Russian bread is good with beer, but is not very popular because of its very strong flavor. Rye bread, with or without caraway seeds, should be served with salt fish, smoked meats, or the more piquant spreads. It should be thinly sliced. German salt-rising bread is delicious with beer, but should be eaten with butter only. It has a peculiar flavor which does not combine well with most foods. Swedish breads make a good carrier for pastes and fish. Rye Krisp is primarily a health bread and is less fattening than others. It is made in a large thin round wafer and has the consistency of asbestos. It may be served in the whole piece, and broken off as it is wanted. It costs fifty cents a pound and lasts forever. Have you run into German salt-raised bread, lately? It sounds perhaps similar to the Jewish bialy roll, for which the term saline only starts to describe Neptune’s tight embrace. The bialy, named for the Polish city Bialystok, likewise suits only butter or at most the blandest cheeses. *Malt grain bread, satisfyingly connected to beer via malt. … he ate some roast beef and drank two pints of ale, stimulated by the flavor of a cow-shed which this fine, pale beer exhaled. The above words are from this online edition of French novelist J-K Huysman’s A Rebours, translated as Against the Grain, published in 1884. This novel was mentioned in beer critic Michael Jackson’s early work, but not in connection with the quotation. 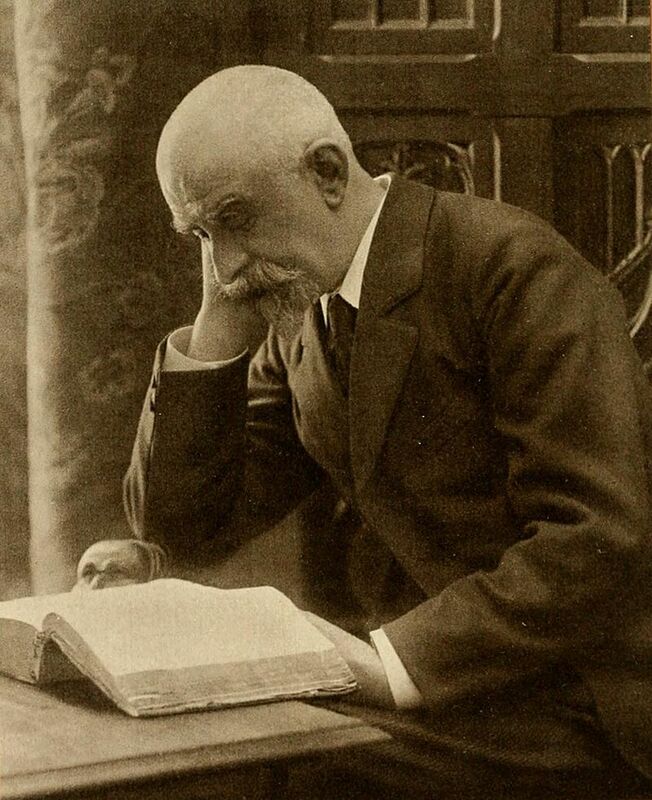 Jackson examined the part where Huysmans (pictured) imagined an all-black meal, one featuring black soups, dark game, sauces the colour of “bootblack”, and kvass and porter to drink. Huysmann was looking to describe extreme experiences of the senses, both in taste and perception, to contrast with the ideals of restraint and the juste moyen sought by bourgeois society. His all-black meal is periodically reproduced in arcane food circles but has never caught on as a fad. Today’s careening culinary and beverage worlds seem perfect for it, yet simultaneous appearance in trendy restaurants of London, Paris, and New York is elusive. The quotation though is further support that well-aged 1800s pale ale, often denominated IPA, had the barnyard Brettanomyces smack. Modern brewers sometimes seek to impart it via inoculation, with evident historical justification, were any needed. Beers of various kinds have always featured “extreme” flavours, probably accidentally initially, that finally grab and retain drinkers’ affections. Hence the development of regional and local tastes. Bitterness itself, from hops, is the best example. Musk features in perfumes, soaps, and other things: why not eatables? It becomes a whet, a stimulant. Huysmans focused on the extreme for its own sensory value and as metaphor for artistic independence. To borrow a term from another artistic and sensory quester, Jimi Hendrix, he “raised his freak flag high”. I argued in my American “musty ale” study last year in Brewery History that the signature of 1800s U.S. musty ale may well have been the barnyard Brett tang, analogous to the contemporary “Bass stink” documented in the same article. A good example of the palate today is the Belgian Trappist beer, Orval. In taste and colour Orval, which has a Brett inoculation, may well be close to Huysman’s Gothic-tasting English pale ale. Countless craft “Brett” IPAs and other styles deliver a similar experience. There is some irony here in the monastic context. The further irony of the translated title, Against the Grain, is more satisfying to contemplate: the book admires idiosyncratic English beer flavours, it doesn’t deride them. Huysmans’ comment on porter, noting the dry liquorice taste, is further evidence of his protagonist’s sophisticated, “grown-up” palate. In contrast, one may infer the sugary form of the flavouring is the province of the undiscriminating or youthful, in line with the judgement of gastronomy. The crown of beverage saccharine was probably Coca-Cola, invented around the time Huysmans’ book was written. (I’m not knocking Coke, I like it myself, but this is a cultural history discussion). His term à rebours has also been translated as “against nature” or “at loggerheads”. It sounds again a rebounding, a stance of contra. As the Sybarite protagonist evidently had nothing against contemporary English beer this suggests its exotic character, to an 1880s Frenchman at least. 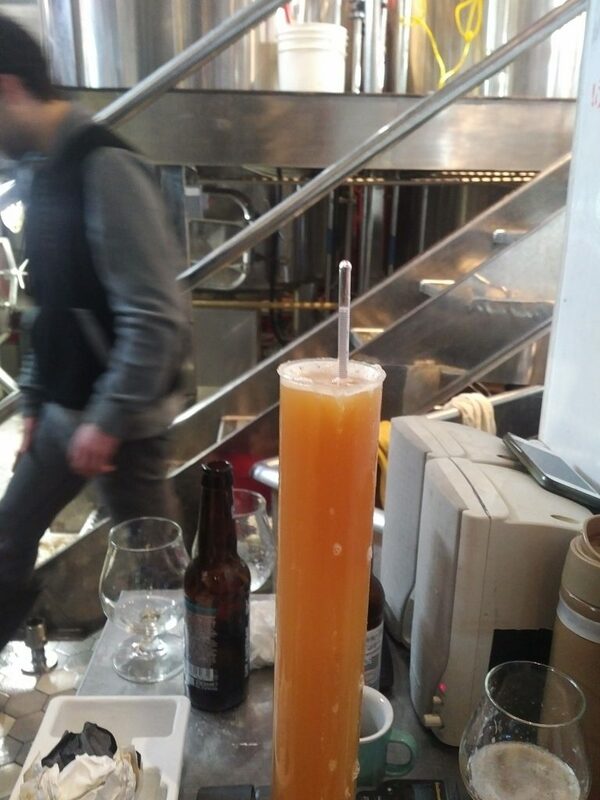 My recent collaboration with Amsterdam Brewery to produce a c.1870 AK bitter, a lower-gravity, “domestic” form of India Pale Ale, sought intentionally to avoid Brett character. 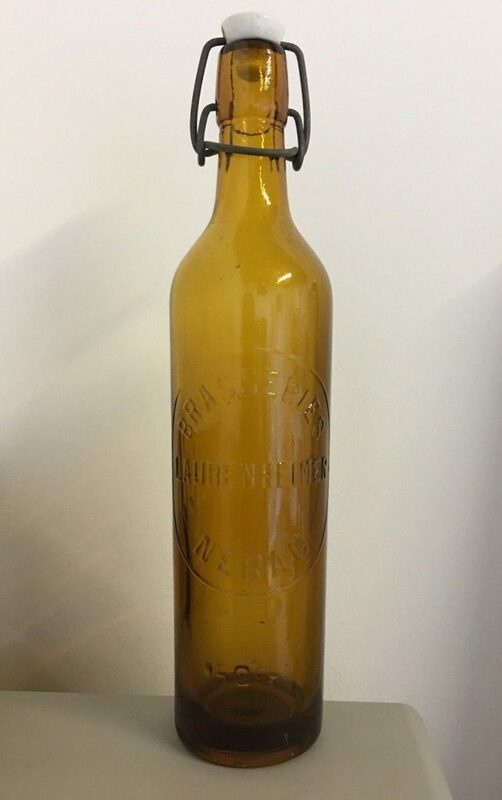 The reason was that storage of pale ale for a few weeks, even in the 19th century in uncoated wood that harboured microflora, probably didn’t produce Brett, or not invariably. Brett generally needs longer to appear in beer as the yeast type awaits the finish of fermentation by conventional brewing yeast to attack the more complex sugars and dextrin in the beer, unless of course the beer is inoculated with Brett to gain the intended character. We did not do that as there was no intent to produce the character of a pale ale aged 9 or 12 months. Nonetheless in practice, some pale ale sold in Victorian England had this character, as appears from Huysmans book, as appears from the contemporary term Bass stink per this discussion in a U.S. Congressional hearing in 1900. The Bass funk may have had multiple causes, as discussed in my musty ale article, but the impact of Brettanomyces on Bass, a classic form of India Pale Ale, is undeniable in our opinion given the later identification of a strain of wild yeast in the Bass yeast – see my article again in Brewery History for supporting references. Huysmans’ reference to a cowshed-tasting “ale” and “pale beer” can only mean an IPA-type beer. 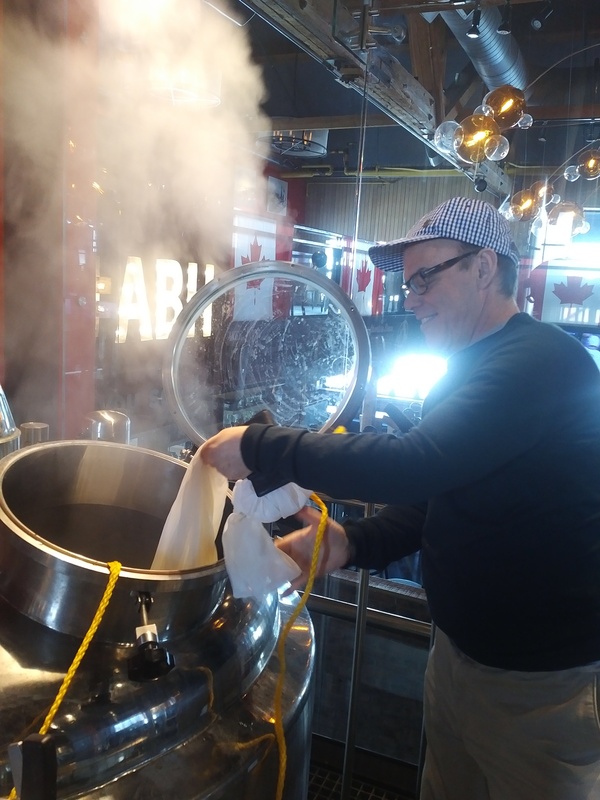 Here are some images of my great brewing day yesterday with Amsterdam Brewery brewers, headed by Iain McOustra, at the Brewhouse on Toronto’s Harbourfront. Cody, Jeff, and Mike brewed at different times and I participated throughout. The brewery is set in a glassed-in room alongside the large vaulted Amsterdam Brewhouse restaurant. It’s a prime location right on the water. We collaborated to make an AK, of the pale ale family, from the era of 1870. I provided the recipe from my own research some years ago, which also stated that AK meant “ale for keeping”. OG was 1050 with final abv likely 5-5.3% abv. Only one malt was used, as typical of the day. 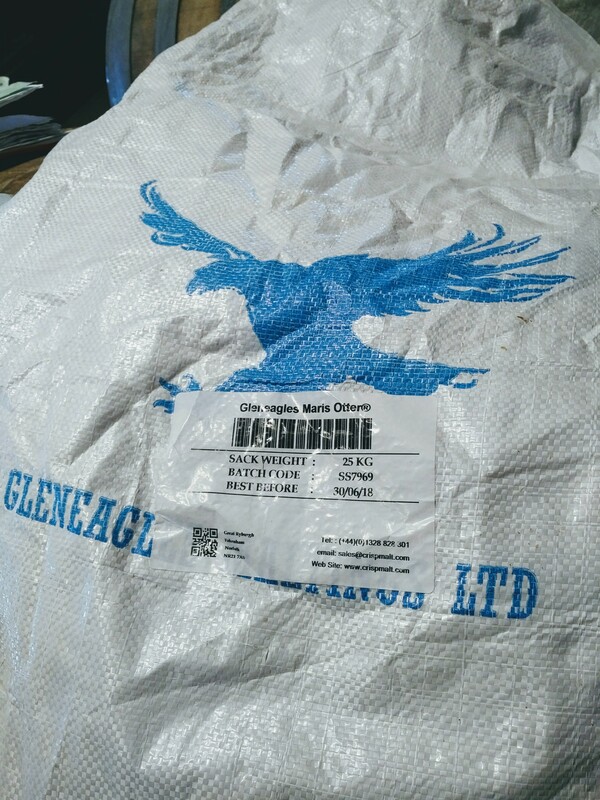 We elected floor-malted Maris Otter from Crisp, marketed under its Gleneagle name. This was after tasting a number of pale malts, unmilled that is, including Crisps’ non-floor malted Maris Otter. The floor malt was cracker-like and fresh, tasted from the drained mash it was almost like a toasty oatmeal (porridge): if you added sugar and milk the similarity would seemed marked. The non-floor-malted Maris Otter when tasted unmilled was less cracker-like, more mealy perhaps. If I could choose an analogy, the floor version was like whole-grain bread; the other, like a high-quality bread from white flour. Both seemed deeper in character than standard North American 2-row malt. 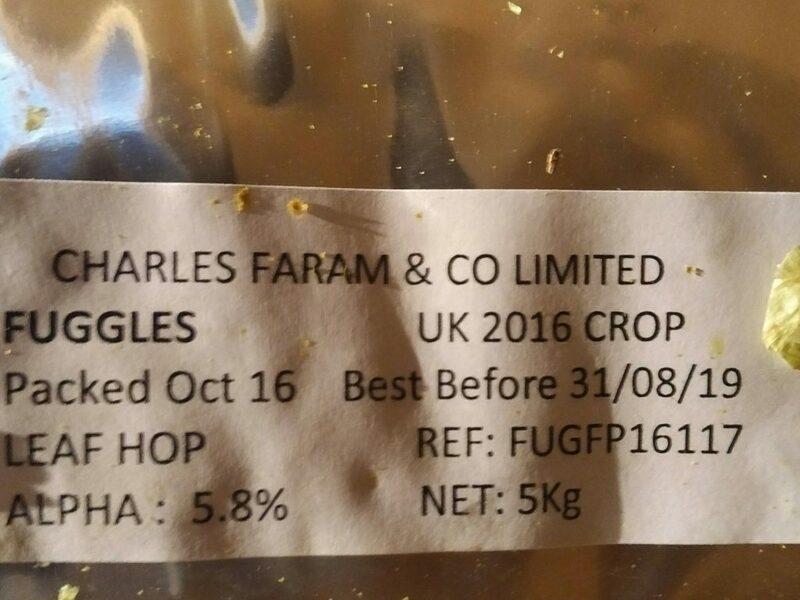 Two hops from Charles Faram were used, Golding and Fuggle, both in leaf form. The hops went in at different times with Fuggles in this case having the say for aroma. Most will be kegged but we hope to do a few casks, and if the casks are dry-hopped we will use one of the two leafs. Any dry-hopping for kegged beer will be with pellets added at tank stage. The Golding was floral and lemony, the Fuggle like an arbor, leafy and fresh-woodsy. These hops come in heat-reflecting tight paks flushed with nitrogen, and are stored cold until use. One was harvested 18 months ago but smelled fresh and sweet, its expiration date was still one-and-a-half years away. We decided on 3 lbs hops per finished barrel of beer (36 Imp. gal. ), with 1 lb more/bbl if dry-hopped (will depend on tasting later). The IBU estimate was 45. We elected two hops on the idea of boosting both complexity and all-English character. Some beers of the pale ale family back then may have used two hops, even if the norm was one. Anyway it seemed right. We chose an American yeast of relatively neutral character. We wanted to ensure the character of the malt and hops would shine through. Still, we hope to get some estery development from fermentation temperature and a few weeks of relatively warm storage. The beer should be ready in about 30 days. While Brettanomyces character was likely part of the long-aged pale ale in the 1800s*, I specifically requested that no brett addition be made. Despite the use of mixed yeast cultures then, I feel the horsey brett character was unlikely with beer aged just a month or two. AK was kept for a relatively short period, where brett character was less likely to form. The idea was to go for a “mild” pale ale palate from this standpoint. (In other words, some pale ale then was stored for relatively brief periods in comparison especially to export IPA). Obviously, we used modern fermenters and pure culture yeast. There was no atmospheric exposure once beer ran from heat exchanger to fermenter blended with the yeast drawn from a sealed keg. Vessels are all-metal through the process, no wooden mashing or fermenting vessels. 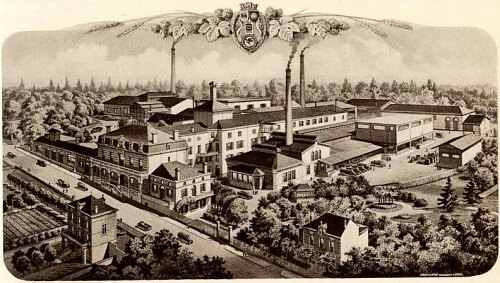 Together with a high degree of sanitation and modern pumping and powering technology, the brewhouse did not resemble in many ways one of the 1800s; few today do. But still we hope to attain a character that people of that era would recognize as their own, hopefully a very high example of their own. I should add: the liquor was Burtonized to match the profile of some gypsum-laden waters classically used for Burton pale ale. The wort from the (relatively short) boil was candy-sweet but very bitter. It carried a striking russet colour the brewers said was unusual in their experience and must have derived from the Crisp malt and the type of malt it was. Indeed, images of pale ale I have seen in colour from the 1800s do resemble it in hue, that orangey-reddish look. *See some telling narrative evidence, here. My Lords, the Appellant complains of an injunction awarded against him so far, and so far only, as it prohibits him absolutely “from selling or causing to be sold any ale or beer not of the Plaintiffs’ manufacture under the term ‘Stone Ales’ or ‘Stone Ale. '” The order was made, in the first instance, on an interlocutory application. Then there was an appeal. The Court of Appeal affirmed the order and maintained the injunction as it stood…. 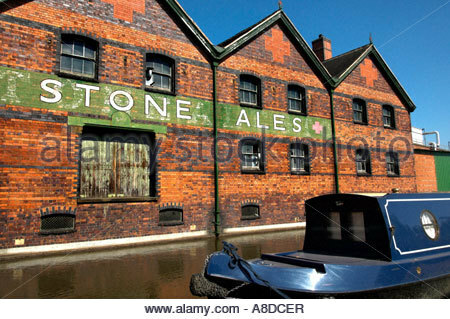 Stone, it seems, is a town in Staffordshire, containing some 6,000 inhabitants. It has a supply of water admirably suited for brewing, so the Appellant says, and his opinion is fortified by scientific analysis. Anyhow, Stone is famous for its ales, which are known in that part of England as “Stone Ales,” and one special quality is known as “Stone Ale.” These ales all come from the Plaintiffs’ brewery, which is said to have been established in Stone for a hundred years, and to have flourished there all that time without a rival, and even without any attempt at rivalry worth mentioning. Whatever reputation, therefore, is attached to “Stone Ales” or ” Stone Ale” above other ales known in the district is due to Plaintiffs and their predecessors in business. The value of that reputation, whatever it is, no one knows better than the Appellant. He is the proprietor of several hotels and public-houses in Liverpool, and in his different establishments he has dealt largely in “Stone Ales” procured from the Plaintiffs. In 1887 he determined to set up as a brewer himself. He had to find a site for his business. Where was he to go? After much consideration, influenced as he says by the peculiar virtue of the water, he resolved to go to Stone. One thing leads to another. Having gone to Stone, he could think of no better name for his brewery than “Stone Brewery”; he could find no more fitting designation for his ales than “Stone Ales.” Then came these proceedings. It is not the first time in these cases that water has got an honest man into trouble and then failed him at the pinch. Neither Mr. Justice Chitty nor the learned Lords Justices could be persuaded that the Appellant was attracted to Stone by the peculiar virtue and chemical properties of the water. They thought he went there simply with the object of stealing the Plaintiffs’ trade, and in the hope of reaping where he had not sown. They were satisfied that he meant to make a fraudulent use of the term “Stone Ales” and that he could not possibly use that term honestly. With the judgment that has been passed upon his character and conduct the Appellant does not quarrel. Protesting that it was somewhat harsh, his counsel use it to point their argument. Granted, they said, that the Appellant is a fraudulent man – as fraudulent as you please – still his demerits cannot enlarge the Plaintiffs’ rights. The injunction being absolute and unqualified in its terms will secure to the Plaintiffs the monopoly of brewing in Stone. With such water Stone might be as Wrexham or Burton. The injunction makes it the private preserve of the Plaintiffs. Then, they argued, the Appellant is not to be deprived of his rights because he has behaved badly. All the Court ought to do is to keep him strictly within his rights. He had a perfect right as everybody has to set up a brewery in Stone. Ale brewed in Stone is Stone ale for all that the Court can say or do. The Appellant is entitled to call his ale what it really is, and to sell it under its true name if he takes care that his customers are not induced to believe that it is of the Plaintiff’s manufacture. His words show a number of traits characteristic both of law and a wider context. For the law, it shows how important the facts are to any judicial contest. Montgomery had owned hotels and pubs in Liverpool on the coast. He had dealt in Joule & Co.’s Stone Ales. He knew how good they were. The wider context concerns the style of court decisions then, and whether today’s simpler way of writing is better. British and Colonial justices under Queen Victoria tended, as writers in general then, to write without economy of expression, leisurely, sonorously. The style was often ornate, roundabout. This allowed however some subtlety. You can see how Lord Macnaghten develops his slightly mocking tone, indeed as he says, one thing leads to another, and his finding is not hard to intuit some time before he gets there. The tone sets the frame for his judgement, in which the other lords concurred. Only much later did judicial writing tighten-up – I mean in style not reasoning. The post-WW II law lord Denning, influential in my time of law studies, was a major force in this. He would write in short bursts and use more simple language than the Latin-loving Victorians. Lord Denning, perhaps contrary to first impression, was not from a modest background. He issued from a well-known clan, his brother, this from 40-year old memory and no I didn’t check Wikipedia, was an Admiralty Sea Lord. Stone is a quiet town in Staffordshire. At least, normally it’s quiet. Its citizens like their beer. Many Britons do. 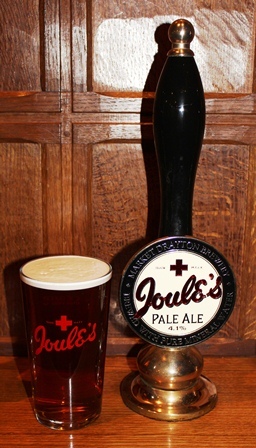 Their favour has always been granted to a local brewer, Joule’s. “Stone Ale” is its prized specialty. It’s been in the area forever. But a new man set up in brewing there recently. Montgomery. His firm’s name is Montgomery’s Stone Brewery. Montgomery has made it clear he wants to sell his “Stone Ale” in Stone. Joule quite naturally objects. This simple trading dispute must now be ruled on by the House. Today, the judges of the Canadian courts, following often American example, write in a simpler style than an earlier time. I’d guess Lord Denning and the plain language movement he helped inspire mean most common law justices do the same in 2018. It’s two ways to get to the same result, I’m not sure one is really better than the other. Yes, a spare style seems to favour the layperson, but then every field has its lexicon, eh? If you simplify too much a gibberish of a different kind results. Anyway, in our western systems and those inspired by them, you can count on the judges to get the law right, or the appellate judges. But the facts are all-important too, and all good judges take care to understand them well. But back to beer: Joule’s has arisen again, with original recipes to boot. See all details here. The original firm stopped trading in 1974, the phoenix arose in 2010. The beer flows in and about Stafford and Shropshire again. More than that, the description on the brewery website of the pale ale (none today are denominated “Stone Ale”) sounds enticingly authentic. For one thing, the brewer last employed by the original Joule’s worked on the recreation. I love recreations, as you can tell. The new brewery is located about 18 miles westerly from Stone, in Market Drayton. Close enough lads of Stone, Shropshire lads (and lasses) too, of age mind. Note re images: the first image above was sourced from Alamy here, and the second at the Joule’s Brewery website linked in the text. All intellectual property therein belongs solely to the lawful owner, as applicable. Images used for educational and historical purposes. All feedback welcomed. Retro Beer & Gourmet Sausage Dinner at Maple Leaf Restaurant 21/02/18: Update! 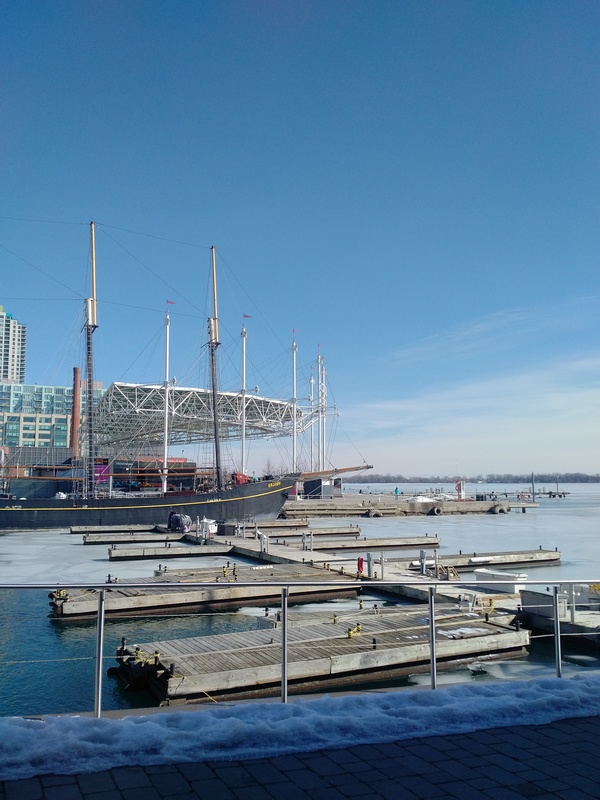 Here is an update to the fab historical beer and food tasting event taking place February 21, 2018 at Maple Leaf Tavern in Toronto. We have the drinks list finalized, see updated menu below. The Maple Leaf Tavern Restaurant, one of Toronto’s top dining destinations east of Yonge Street, is giving a six-course Retro Beer and Gourmet Sausage Dinner on Wednesday, February 21. The food menu and drinks list are appended below. The dinner is intended as homage to a 1973 beer and food event held by the Wine and Food Society of New York at the Waldorf Astoria Hotel. I’m co-hosting with Canadian Beer News. Beers served are drawn from or similar to those at the original, 1973 event. Earlier, I described that event in this post. You can see the original menu and how we’ve sought to re-imagine it. The evening will be a window on beer and food as it was not long before the artisan beer and culinary scenes gathered pace from the 1970s. Actually, they had it pretty good! I have previously written or presented on numerous aspects of early tastings by the International Wine and Food Society. Their events are not just pioneering and of great historical interest but offer some fine eating and drinking. Guests will be able to appreciate how beer and food were creatively selected and paired by a noted culinary society – by those interested in good food and drink – before the world was such a global village. Greg Clow of Canadian Beer News, Canada’s premier resource for beer and brewing industry news and events, will make initial remarks. I will follow to explain the concept of the evening and some fascinating gastronomic and drinks history. Following the original concept, the meal is sausage-focused, an opportunity to taste rare European specialties. All are custom-prepared onsite by expert chef Jesse Vallins. Seating begins at 6:30 p.m., with dinner service starting at 7:00 p.m. The dinner and pairing is priced at $105.00 per guest, pre-taxes and gratuity. Seats are limited. Tickets can be purchased at Maple Leaf Tavern or by calling 416-465-0955. Greg will bring a dynamic music playlist from the era to ramp up the atmosphere of ’73! Don’t miss it if you can attend.